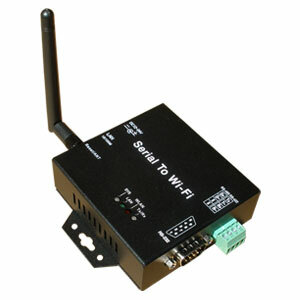 The WF950 is a solid high performance 1-port serial RS232, RS485, RS422 WiFi adapter (also called a wireless device server), which will allow you to send and receive serial data over a standard WiFi network. It is designed around the popular Atheros AR2317 processor which offers great reliability and performance including many features and functions rarely seen in this price range. 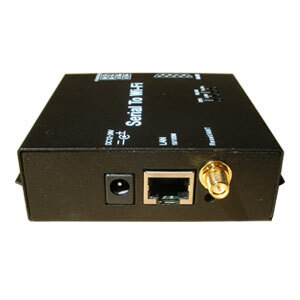 In Infrastructure mode or Ad-Hoc mode, the WF950 can communicate with any host computer through an access point, or with another WF950 located up to 300 feet (100 meters) away. The received data will be queued in the internal buffer until all the delimiters are matched. When the buffer is full (4K Bytes) or after the 'Flush Data Buffer' timeout, the data will also be sent. 'Flush Data Buffer' timeout can be set from 0 to 65535 seconds. With the integrated System Log Configurator you can specify if you want to receive system notifications, at what interval and also how you want to receive these, by email, SNMP Trap Server or TCP Server Logs. The following notifications are available: Hardware Reset (Cold Start), Software Reset (Warm Start), Login Failed, IP Address Changed, Password Changed, Access IP Blocked, Port Connected, Port Disconnected. A maximum of 4 delimiters (00-FF, Hex) can be defined for each direction. The data will be held until the delimiters are received or the Flush Data Buffer times out. The serial device will send TCP alive-check packages in each defined time interval (Alive Check) to the remote host to check the TCP connection. If the TCP connection is not alive, the connection will be closed and the port will be freed. You can manually select the number of simultaneous host connections you want to allow to the converter. 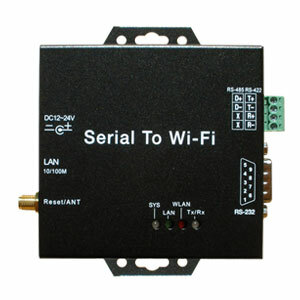 This function will let you specify which IP addresses that can connect to the converter. The Force TX interval time function specifies the timeout when no data has been transmitted. When the timeout is reached or the TX buffer is full (4K Bytes), the queued data will be sent. 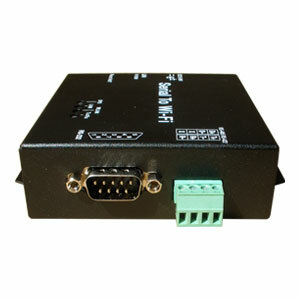 When the serial port stops data transmission for a defined period of time (Idle Timeout), the connection will be closed and the port will be freed and try to connect with other hosts. Please refer to the Web Configurator for all functions and default settings.